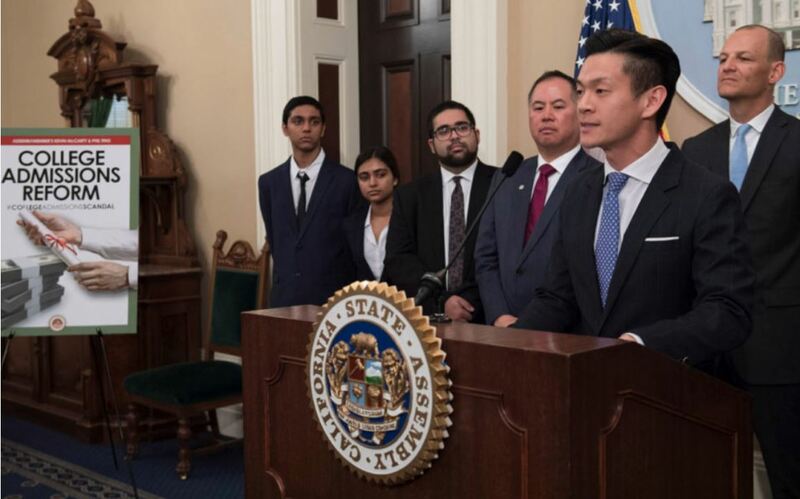 In the wake of the national college admissions scandal, state legislators are introducing measures aimed at preventing future abuses at California public and private campuses and limiting the influence of money and alumni connections. Future legislation will call for an end to so-called legacy admissions, which give preference to children of donors and alumni. Democratic Assembly members are also proposing tighter oversight of athletics admissions at public universities, the regulation of private admissions counselors and the possible phase-out of standardized tests, such as the SAT, as an application requirement. “This scandal not only undermines the public trust in the college admissions process but it perpetuates the opportunity gap in our colleges across California,” Assemblyman Kevin McCarty, D-Sacramento, who will sponsor some of the proposed legislation, said at a press conference March 25 in Sacramento. He noted that much of the scandal, with allegations of bribery and test cheating, was centered at California campuses, including UCLA and the private University of Southern California. Probably the most controversial proposal, from Assemblyman Phil Ting, D-San Francisco, would deny state Cal Grant scholarship funds to public or private schools that give children of donors or alumni preference in admissions. The state’s 10-campus University of California and 23-campus California State University systems say they don’t use such preferential legacy admissions. But many private schools do and say it is an important and legitimate part of their traditions if used properly. Cal Grants use state money to help pay tuition for low- and middle-income students and the funds are paid to colleges on their behalf, an important source of revenue for the schools. Ting said his goal is fairness. “We’re just trying to ensure there is a level playing field for everyone,” he said. Private colleges already are gearing up to fight that proposal, saying it is inappropriate for the state to threaten a withdrawal of Cal Grant funding. The state’s public university systems seemed more receptive to some of the ideas. Both issued statements noting that reviews of admissions practices are underway. A McCarty bill would add oversight to the so-called special admissions, also known as “admission by exception,” at UC and CSU. Those admissions allow for students with special talents, often athletic or musical, to gain entrance even if they do not otherwise meet all standard admissions requirements. UC has estimated that about 2 percent of its incoming classes enter through that exemption. But given that athletic coaches allegedly enrolled students who never played the sport for which they were admitted, the plan would require that at least three administrators, including the president or chancellor of the campus, review all such special cases. Another measure, advocated by Assemblyman Evan Low, D-Cupertino, would tighten regulation of private admissions counselors and seek to limit the influence of people like William “Rick” Singer, the California admissions consultant who pleaded guilty to being the mastermind of the college corruption scheme. College entrance consultants and firms generating annual income of at least $5,000 would have to register with the California Secretary of State’s Office, who would then be authorized to develop regulations for the industry. A related measure would seek to eliminate state tax deductions for charitable contributions to organizations or colleges if that payment was actually part of a criminal attempt to gain college admission. In Singer’s case, parents allegedly gave money to a phony charity he established and used to funnel bribes to coaches at elite schools, prosecutors said. If anyone is found guilty in such a scheme and previously deducted such a donation from their state taxes, they will have to repay the state and likely face a fine. Another proposal calls for UC and CSU to study the usefulness and fairness of standardized tests like SAT and ACT in admission decisions. McCarty said he wanted the systems to also review whether the exams should be phased out of the application process. The UC system is already conducting a study about whether it should continue to require those standardized tests for applicants. Besides long-standing controversies over how well those exams predict student success in college, the recent scandal has further shaken confidence in those tests because some parents allegedly paid to have their children’s scores inflated. The state’s other large public university system, the CSU already is reviewing its admissions policies to ensure equity and honesty and also is conducting an informal discussion about the use of the SAT and ACT in admissions, according to Mike Uhlenkamp, CSU public affairs senior director. If the Legislature calls for a statewide study of the tests, CSU will cooperate, he said. While the proposals seem likely to be popular among many Californians, especially families with children applying to college, strong opposition was voiced by private colleges in the state. The Association of Independent California Colleges and Universities (AICCU) is “greatly disappointed” by the legislative ideas, especially the proposal to withhold Cal Grants from schools that give children of alumni any admission preference, according to a statement from the group’s president Kristen Soares. The organization — which includes 84 private, nonprofit schools including USC and Stanford University — defended so-called legacy admissions for children of alumni. “These potential students have a unique connection to the institution and that connection is sometimes considered as one of many factors in the holistic admissions review. AICCU institutions are committed to admissions and recruiting policies that are grounded in a commitment to integrity and ethical conduct. Colleges and universities should retain the right to consider a student’s connections to the institution as one component of their assessment, and it would be inappropriate and unfair for the state to jeopardize student Cal Grant eligibility for doing so,” Soares said. A University of California statement said its 10 campuses share the Assembly members’ alarm about the corrupt admissions practices and “look forward to working with legislators to address their concerns and proposals.” The UC statement noted that the system already is cooperating with law enforcement on the criminal probe and has begun its own internal investigation of its admissions practices. “We understand that not every process is perfect. We not only are reviewing these practices, but also looking for ways to improve them. We will stay proactive, transparent and accountable,” the statement said. Previous PostDiminishing Returns: Is the state running out of ways to lead voters to the polls?